The new mass storage CmCard/CFast for product and IP protection is available with flash memory in the range of 2 GB to 16 GB. Wibu-Systems is first announcing the new CmCard/CFast memory card with integrated CodeMeter protection at the automation expo SPS IPC Drives 2013, booth 640, hall 7. Maximum reliability is a prerequisite for storage solutions in safety-critical applications. The solid state mass storage drives will therefore offer high reliability, robustness, shock and vibration resistance, as well as short access times and low error rates. In addition, security against manipulation in industrial systems is becoming increasingly important. Manufacturers will benefit from the new CmCard/CFast in several ways: the highly secure smart card chip stores cryptographic keys and handles complex functions for integrity protection, know-how protection and flexible licensing; data can be stored and retrieved quickly, with a transfer rate that reaches up to 300 MB/s (SATA II). 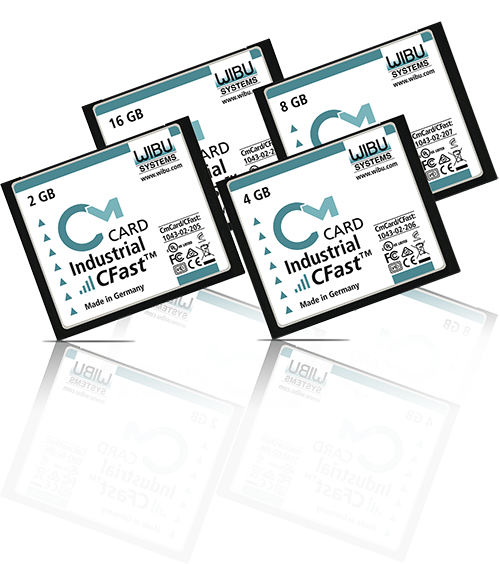 The CmCard/CFast is now available in sample quantities featuring 2GB, 4GB, 8GB and 16GB memory capacity; mass production is set to start in Q1/2014. By default, the product is designed for usage in an extended environment temperature range of -25ºC to +85ºC, which is kept monitored via integrated temperature sensors. Sophisticated NAND flash management mechanisms detect internal bit errors early on and take appropriate actions beyond threshold. Data can be analyzed through the SMART protocol. Thanks to the power-fail protection, no data is lost even in the event of unexpected power interruption. Furthermore, the device uses high-quality Single-Level Cell memory (SLC); with this technology each flash memory cell stores only one bit and data retention is thus guaranteed for a period of 10 years. These cards will remain accessible in the market for a long time, their bill of materials (BOM) is fixed and has passed through a scrupulous qualification process, and they are subject to a Process Product Change Notification (PCN). Oliver Winzenried, CEO and founder of Wibu-Systems, explains: “In terms of product, know-how and integrity protection, only the combination of security and reliability sustains the automation industry to uncover industrial espionage, product piracy and sabotage. I expect a strong demand in general and especially this year at SPS IPC Drives, because our CmCard/CFast is the world's only CFast card integrating CodeMeter encryption functionalities. Its ingenious concept is sure to inspire manufacturers: the requirements of Industry 4.0, including the standard OPC-UA, are in fact optimally supported by the proven CodeMeter technology".